Frances Fitzgerald TD, Minister for Children and Youth Affairs has launched a public consultation on improving the lives of children and young people. Are you a young person? If yes, then this is YOUR chance to have YOUR VOICE heard. You can influence the policies and strategies that will impact on YOUR LIFE over the next five years. Are you a manager, staff member or volunteer in an organisation that works with young people? If yes, then this is your opportunity to inform the policies and strategies within the Department over the next five years. How do I give my views? 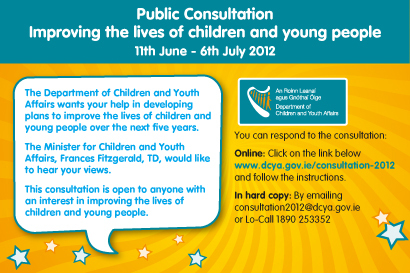 Easy Peasy, Just click on this link www.dcya.gov.ie/Consultation-2012 and it will bring you straight to the consultation page. All it takes is a few moments of your time. The consultation will inform the development of all key policies and strategies within the Department for Children and Youth Affairs over the next five years. 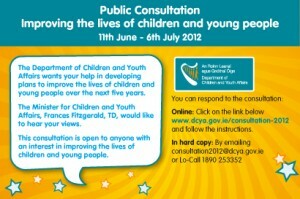 The closing date for the consultation is Friday, 6th July 2012. Thank you for taking the time to consider and complete the consultation document.